The noble town of Modica, a Sicilian Baroque work of art, shows traces of its Hellenic past: this town, which the Greeks called Μότυκα, dates back to the 23rd century and it was populated by the Siculi. According to the historians Ellanico and Filisto, the Siculi founded the town in 1360 BC, 80 years before the Trojan War, and named it Mùrika. On the contrary, the Greek historian Thucydides (460-404 BC) reminds us that all the towns in Eastern Sicily date back to 300 years before the Hellenic invasions, a bit before 1000 BC. 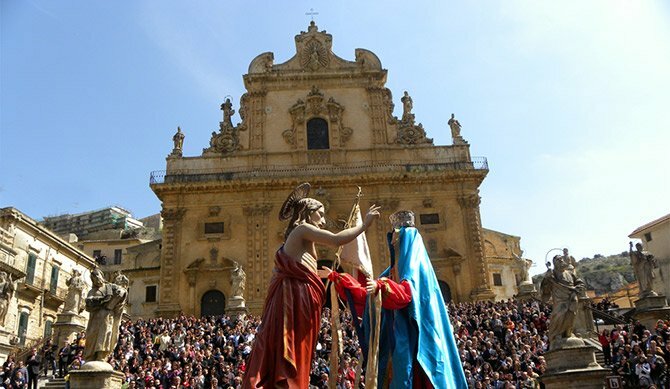 There are many different legends about its foundation, but the Greek invasion is the event that most influenced the historical imagination about this town’s origin, to the extent that from the 17th century to the early 19th century Modica was called “Hercules’city”, as recorded in the contemporary accounts. There is a romantic legend that connects Hercules the hero (Heracles, as he is called by the Greeks) to Modica: it is said that he founded three cities in Sicily, naming each of them “Motia”, in honor of a Greek woman who helped him in one of his heroic feats. Even historians have passed on the legend of Hercules as founder of Modica: Buonfiglio, historian from Messina, in 1604 wrote: “Hercules, once in Italy, made war against many tyrants for ten years, and in Sicily defeated the Cyclops, the Laestrygonians and built Motuca”. 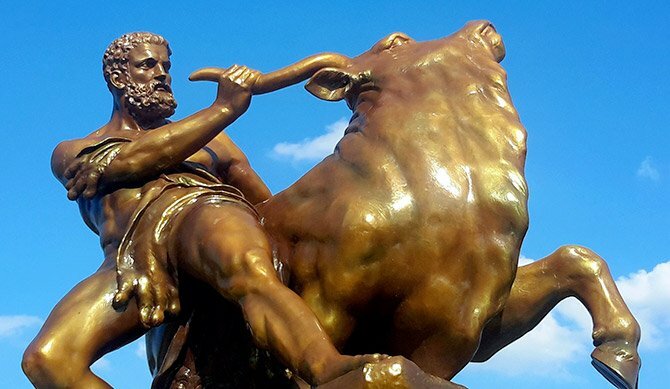 This myth comes from a centuries-old story, the Labors of Hercules’ one: the tenth labor of the son of Zeus, king of the gods, and a mortal woman named Alcmene, was to fetch a herd of red cattle belonging to Geryon the giant, in Spain. After defeating Geryon, Hercules took the herd of cattle to Italy as a trophy, but once in Sicily the animals got stolen. The beautiful Motia told Hercules where the cattle were, and there, in honor of the woman who helped him, he founded three cities with the same name: Mozia near Capo Lilibeo, Mozia near Agrigento and Mozia on the Mediterranean, which is now Modica. In the Modica’s Public Museum““Franco Libero Belgiorno”“ there isa precious bronze statue, kept in a secured display case, representing Heracles. It was found in 1967 in Cafeo and it has been in the museum since 1996. The hero is represented naked, with his left hand holding a bow; his right hand was probably leaning on a club. He is wearing a long leonine headgear, with the lion’s forepaws tied in knot across his chest. The statue, initially dated to the late 3rd century BC, has been today dated to the late 5th century BC. The Modicans consider the bronze statue a symbol of their legendary past, which they love to hand down to all the travelers who look for hero stories and mythological feats: fantasy is often more inebriating than truth and when we talk about Sicily it is really hard to resist to the charm of storytelling. During your stay at Edel hotel let yourself be seduced by this ancient charm: take the chance and ask foruna a tour guide who will show you the main local attractions, on the trail of the Greeks and the Siculi, who made Modica’s history prestigious and glorious. Once you are back from the tour, take your time relaxing in the shade in our garden, to keep on thinking about incredible feats and stories of heroism.